Located between the French regions of Avignon and Provence, the luxury camping site of Les Rves du Luberon provides families with endless hours of entertainment that are flanked by some of the most beautiful surroundings throughout all of Europe. Those who are interested in learning more about this camping holiday should always contact LuxCamp. Why Should I Opt for this Holiday Camping Site? Dogs are allowed during the peak season. A selection of mobile homes and bungalows to choose from. The region of Provence is located within southeastern France and quite close to the Italian border. Thus, the climate here is very agreeable throughout most of the year. Summers are notably warm and dry; ideal for a luxury camping excursion for those who are looking to avoid excessive heat. The nights are agreeable as well. The breezes from the nearby mountains help to provide cooling breezes. 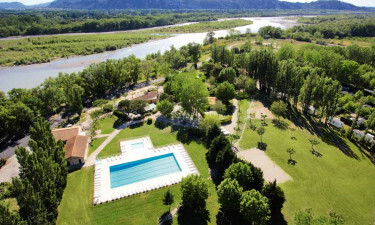 Although the levels of camping luxury here cannot be overstated, it is just as necessary to point out that Les Rives du Luberon is known for the sheer variety of activities to enjoy. A game of table tennis is perfect for any afternoon and should the sun prove to be high overhead, it is always possible to relax in a large open-air pool found within these confines. A bicycle hire centre is available to explore the surrounding countryside. This luxury camping site is further defined by the number of services which are provided to all campers. Each mobile home can access free wireless Internet. There is also a separate physical terminal found on the property. Each private pitch is supplied with its own electrical power. Other amenities include a games room, air conditioning and satellite television. This holiday camping site offers its guests a chance to experience the gastronomical delights of the Provence region. Not only is the menu here varied, but it also offers international dishes. The number of choices available is perhaps only superseded by the ambiance itself. Its confines reflect the more traditional aspects of France and it is always possible to enjoy a peaceful candlelight dinner. 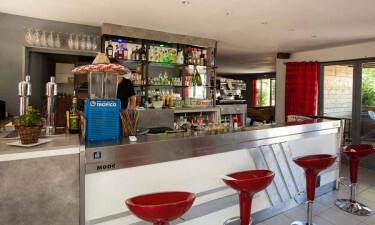 A bar within the restaurant boasts a wide selection of regional wines as well as speciality cocktails upon request. So, an aperitif is literally moments away from one's table. A bakery offers fresh bread during the peak of the tourist season. There is also a moderately sized grocery outlet for those looking to pick up fruits and vegetables, frozen foods and basic sanitary items. Please note that other facilities are located only a short distance outside of this luxury camping resort. Should anyone have further questions in regards to the possibilities at Les Rives du Luberon, it is wise to speak with an expert at LUX-camp.